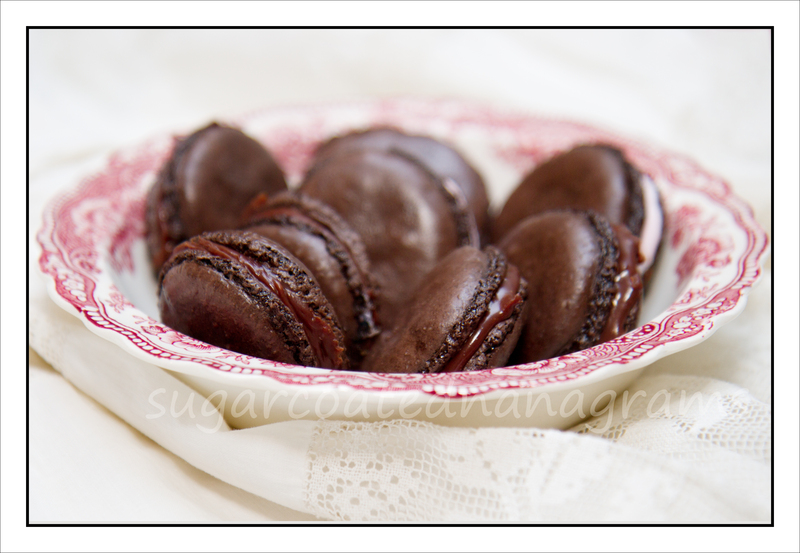 Chocolate Macarons have a slightly different texture than other Macarons. Some bakers find them easier to master. The technique for making all Macarons is the same. I have made a video showing what works best for me, and it might help you too! I have also listed some tips to help with the process here. Digital Scale – I have found that weighing my ingredients is a far better predictor of success than measuring them. Cookie Sheets – I have the best success with cookie sheets that have low sides. Sift Almond Flour, Cocoa and Confectioner’s Sugar into a bowl and then whisk them together until they are well mixed. Put egg whites, granulated sugar and salt into the bowl of your mixer. Start your mixer on medium (about 4 if using a KitchenAid) and beat for a few minutes. Gradually increase the speed to high and beat them until the meringue is stiff, glossy and almost dry. If you want colored Macarons now is the time to add a gel food color. I don’t recommend liquid food coloring. Next, add about 1/2 of the dry ingredients to the meringue. Mix until incorporated. You don’t need to be too gentle at this point. Add the rest of the dry ingredients and mix gently until no white meringue is visible. If you watch my video, you will see that the motion to do this is to both fold and rub/smear the batter against the side of the bowl. Remember that macaronage (the French term for combining the ingredients) is about deflating the whites, so you don’t have to treat them gently. You want to knock the air out of them. Stir to deflate the egg whites until the batter is the consistency of lava and flows off your spatula. My video shows an example of the method I use to mix the batter. Pipe the batter onto either parchment paper or a silicone baking mat. I have the best success with cookie sheets that have low sides, not sheet cake pans. Bake at 310 degrees for about 15 minutes. Check for to see if they are done by giving them a little wiggle with your finger. If the tops move easily, they are not done. You want them set but not firm. It’s better to be a little underdone than over done. All ovens are different and if you aren’t sure that your oven is accurate, you may want to check it with an oven thermometer. Let cool, match cookies and fill. Refrigerate for at least 24 hours. You can eat them right away but they are best the next day. They also freeze beautifully, either filled or unfilled.